My enthusiasm for Amanda Palmer and Neil Gaiman is well documented on this site so it should come as no surprise that Wednesday’s #ninjaTED event was the highlight of the week for me. It all started innocently enough. Amanda tweeted a call for a venue for one of her ninja gigs – spontaneous shows like the one she and Neil played at Fluevog. By Wednesday, in another demonstration of the power of both Amanda’s following and the internet at large, the ninja gig had turned into well over three hours of interviews, poetry, songs and stories featuring a mix of TED speakers, local and international musicians and of course Amanda Palmer and Neil Gaiman – all with the goal of gathering donations for the Vancouver Food Bank and creating some “realtime cross-over with the people here in TED-land and the population of Vancouver”. After standing in the unseasonably cold (but thankfully dry) Vancouver streets for over three hours my wife and I were relieved to get into the warm and inviting Vogue Theatre (who’d donated their space for the evening). The room was already full of energy. Vancouver’s Orkestar Slivovica brass band were playing some lively Balkan tunes, the belly dancers were in fine form and fans were dancing in the aisles. Twenty minutes later the show started. What followed was an experience I’ll never forget. From the opening performance of In My Mind, one of my favourite Amanda Palmer songs, to the now mandatory Ukulele Anthem that closed out the show, I was glued to the “structured chaos” on stage. After In My Mind, Neil took to the stage to read a story and sang Psycho by Leon Payne. Then, Jason Webley played a fantastic piece about his desire to own a giraffe. Later in the show he played his TED song – Why? which was equally good. Neil and Amanda then performed mini-interviews with American football star turned equality advocate, Chris Kluwe and Del Harvey, Twitter’s head of safety. Next up was more music from Imogen Heap and Geoff Berner closely followed by pieces by some of the “TED Fellows”. Usman Riaz was up first, playing his guitar like a piano and he blew everyone away with his skill. It’s basically impossible to describe so here’s a video. Once the crowd had sat down again, David Moinina Sengeh rapped and Bora Yoon created an amazing, layered piece using a repeating mix of instruments and her voice. They were then joined (I think) by Dan Visconti, and Susie Ibarra. Then it was back to the TED speakers. An exuberant Amy Cuddy got everyone striking power poses and squee’d over appearing on stage with Amanda Palmer and poet Sarah Kay performed a piece inspired by the death of Nelson Mandela that I hope someone recorded (I’m off to buy her debut collection No Matter the Wreckage once I finish this post). It turns out there’s an alternative conference that runs alongside TED called BIL (do you see what they did there?) and Amanda had a quick chat with organiser Michael Cummings. Tickets for TED are expensive – $7,500 expensive. BIL entry is by donation and aims to open up similar talks to a much broader audience. The final guest, and the one that got the warmest reception (bigger even than Amanda and Neil) was astronaut turned Canadian hero turned rock star – Chris Hadfield. The evening finished up with Palmer singing her song, Astronaut, to Hadfield and the aforementioned Ukulele Anthem. Over seven hours after we joined the queue outside, my wife and I filed out of the Vogue, knowing we’d been part of something special. 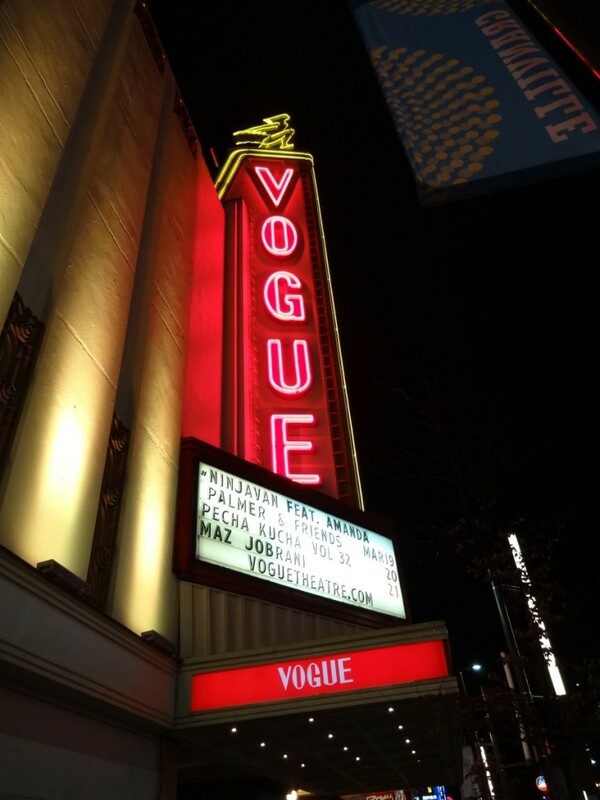 By the end of the night, thanks to Amanda Palmer, her guests, the Vogue Theatre and all the other volunteers, #ninjaTED had entertained over 1,100 people and raised almost $10,000 for the Vancouver Food Bank.